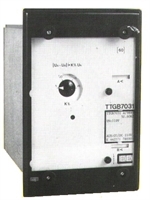 The TTG7034 voltage balance relay indicates the failure of voltage transformers or their associated fuses (ANSI code 60). It achieves this by comparing two different sets of three-phase voltage inputs. It has separate sets of output contacts to indicate which of the two sets of voltage inputs has dropped below the acceptable threshold (indicating VT failure). It has adjustable sensitivity. See the homepage for Static relays for the full brochure.